« Strategic landmark inside the Park of the Château de Versailles, one discovers the Dragon’s Basin (Bassin du Dragon) like an outcome at the end of the perspective of the Alley of Water (Allée d’Eau). 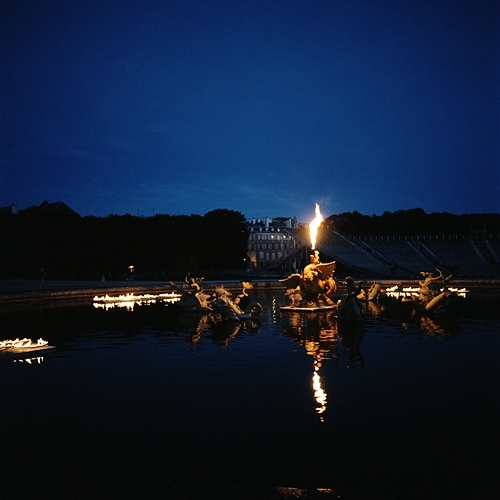 For Versailles Off, I created an installation that would “turn water into fire” and transform light into a fluid material : a fluid inscription that would surface on the water. In the middle of the basin, the Dragon wakes up : while huge puffs of fire come out of its mouth, jets of fire gush out of the tritons’ nostrils at the same moment. Casting light on the surroundings, light – transformed into liquefied fire – starts writing a word in front of each triton. In order to decipher the message, visitors rotate around the basin as if they were trying to find the clue to the riddle. When the “lava” floating at the surface of the water narrow down, the words disappear vanish away.